Lao PDR has grown relatively rapidly, but needs to focus on the non-resource sector to innovate, diversify its economy and generate more inclusive wealth. SME are a key component of that strategy. As Lao PDR is a small (6.7 M) land locked country, but conveniently located and part of ASEAN, a lot of growth will require developing stronger, value added exports. This journey begins with dramatically improving the enabling environment to start up and grow small and medium businesses (SME). That requires removing regulatory barriers (of which there are many!) and providing SME with access to ‘growth drivers’ – markets, business support services and finance. The Government of Lao PDR (GoL) wishes to reform the enabling environment for SMEs and most recently (February 2018) the Prime Minister office has issued the order No.02/PM on Improvement of Regulations and Coordination Mechanism on Doing Business in Lao PDR – the title is fairly self-explanatory! A number of development organisations are supporting the reform agenda – EMC has worked in trade / investment / competitiveness for GoL (customs, transit trade), World Bank (various trade projects), ADB (private sector assessment), IFC (SME tax), GIZ (SME & ASEAN), USAID (regulatory reform) and others. 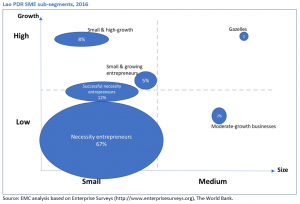 Also, most recently, analysis of the ‘entrepreneur ecosystem’ (Dutch Government) to examine the specific constraints facing entrepreneurs, and owners of growing (> 10% pa) small and medium businesses. United Nations Capital Development Fund (UNCDF) is working in access to finance, and a number of development organisations are working in vocational training / TVET – Lao PDR is unusual, in that it faces not only a shortage in skilled labour but also un- and low-skilled labour, as described in this blog post. Up and coming projects include World Bank funded / GoL implemented projects to improving regulation and reducing transaction costs around ‘starting a business’ and ‘business operating licenses’, USAID Laos Business Environment and World Bank ‘Business Assistance Facility II’ which will provide technical assistance and matching grants to Laotian SME, to acquire professional services. 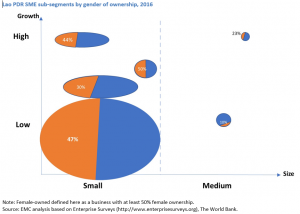 An example of earlier programmes, include the Mekong Women’s Entrepreneur Challenge – here’s a story of a successful Laotian women entrepreneurs engineering service business. Given the ongoing interest here’s some segmentation of World Bank Enterprise Survey stats, that demonstrate the imbalance of SME; they’re overwhelming small, and compared to large firms, less sophisticated.